The Linksys E2000 Advanced Wireless-N Router lets you access the Internet via a wired or wireless connection. It has four (4) Ethernet ports that can be used to directly connect your wired computers. The Linksys Wi-Fi Router, the Linksys E2000 comes with Linksys Connect software that allows you to easily manage your router’s wireless settings. To download and view the Linksys Wi-Fi Router, the Linksys E2000’s quick installation guide, click here. The LED lights up green when the port is connected to a Gigabit port or blue when the port is connected to a 10/100 port. If you have client devices, such as wireless adapters, that support WPS, then you can use the WPS button to automatically configure wireless security for your wireless network(s). Client devices are those that communicate to the router, access points or gateways. To learn more about WPS, click here. The Wireless LED lights up when the wireless feature is enabled. 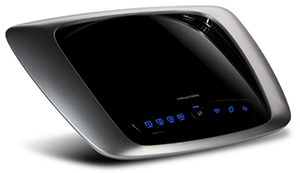 It flashes when the Linksys Wi-Fi Router, the Linksys E2000 sends or receives data over the wireless network. The Internet LED lights up green when the port is connected to a Gigabit port or blue when the port is connected to a 10/100 port. The Power LED lights up when the router is powered ON. When the Linksys E2000 goes through its self-diagnostic mode during every boot-up, the LED flashes. When the diagnostic is complete, the LED is continuously lit. The Internet port is where you connect the network (Ethernet) cable from your cable/DSL modem. In most cases, you will be connecting one end of the network cable to the Ethernet port of your cable or DSL modem and the other end to the Internet port of your Linksys E2000. Using network cables, these Ethernet ports (1, 2, 3, 4) connect the Linksys E2000 to computers or other devices on your wired network that have Ethernet ports such as gaming consoles, HDTVs, Blu-ray Disc™ players, or printers. There are two (2) ways to reset the Linksys E2000 to its factory defaults. You can either press and hold the Reset button for approximately five (5) seconds, or restore the defaults from the Administration > Factory Defaults screen in the Linksys E2000 web-based setup page. NOTE: After resetting the router, your Internet and wireless configuration will be erased. To know how to reinstall the router, click here. QUICK TIP: To log in to the router’s web-based setup page, just leave the User name blank then enter the default Password “admin”. The Power port is where you connect the power adapter. Linksys products vary in their power adapter specifications. Depending on the model of the Linksys device, the power adapter voltage and current specifications may differ. To know how to check the power adapter specifications of your router, click here.